In this article, we highlight the 20 best online schools for marketing bachelor’s degrees in 2016-2017. A bachelor’s in marketing degree from an accredited institution can lead to plentiful job options. Marketing majors learn applicable business knowledge and entrepreneurial skills that transfer seamlessly into business organizations and marketing roles. Marketing programs are designed to equip students with training that is necessary to succeed in the business world. Earning a marketing degree does not necessarily mean that you have to give up your current day job or eliminate family and life responsibilities. Today, some of the nation’s top accredited colleges and universities offer online marketing degree options. We examined 136 accredited colleges and universities that offer an online bachelor’s in marketing or a bachelor’s in business administration with a marketing concentration. For this list of schools, we noted the percentage of applicants admitted, graduation rates, undergraduate tuition/fees, and student-to-faculty ratios. Our data was taken from the most recent information published by the National Center for Education Statistics (NCES) College Navigator. 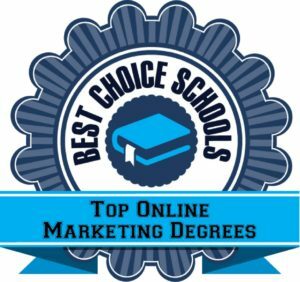 We used this information to develop our list of the 20 best online schools for marketing degrees. In the event of a tie, the institution with the lowest tuition was awarded a higher ranking. Our methodology is listed below. Students can major in marketing with a social media marketing concentration at Southern New Hampshire University. Southern New Hampshire University is one of the best online schools for marketing, offering an accredited bachelor’s with a concentration in social media marketing. The program may be completed at your own pace with over six nine-week terms per year. All classes are delivered online and include consumer behavior, market research, professional selling, social media and marketing communications, and strategic marketing planning. The social media concentration requires classes in advertising copy and design, advertising media planning, and supply chain management. Southern New Hampshire University’s undergraduate programs have earned rankings from major publications like U.S. News and World Report, and the school is recognized as a best regional university in the North. Colorado State University-Global Campus offers one of the top online marketing degrees. Colorado State University-Global Campus is one of the top online schools for marketing. Working and busy students may earn a bachelor’s in marketing without having to attend classes on campus. Classes are delivered 100% online and include consumer behavior, international and multi-cultural marketing, introduction to marketing, personal selling and sales management, promotion and public relations, retail marketing and management, and strategic marketing. Eighteen specializations are available for those interested in exploring a particular marketing focus. Specializations include information technology management, project management, small business and entrepreneurship, and strategic communications. U.S. News and World Report ranks Colorado State’s online bachelor’s programs #86 out of over 1,200 programs. University of Maryland is one of the best online marketing schools to earn an undergraduate degree. One of the best online marketing schools to earn an undergraduate degree is University of Maryland. The school offers low in-state tuition for online students and several minors available for marketing majors. All courses are taught online by the same university professors who teach on campus. Online courses include consumer behavior, global marketing, managing customer relationships, marketing research, nonprofit marketing, and strategic marketing management. While the university is ranked with major publications like U.S. News and World Report, the school’s online programs have also earned recognition. In fact, the online bachelor’s programs have ranked in previous years among the best online bachelor’s programs in the nation. Franklin Pierce University offers one of the best online programs for marketing in the North. Franklin Pierce University lands a spot on our best marketing schools online programs list for 2016-2017 because of the low student-to-faculty ratio and relatively high graduation rate. To accommodate working students, the school offers a bachelor’s in marketing degree program that may be completed entirely online. Online marketing classes include electronic commerce, marketing management for a green economy, marketing research, and organizational behavior. Both full-time and part-time options are available to suit the needs of busy adults. Franklin Pierce is a top-ranked institution that is ranked by major publications like U.S. News and World Report. In fact, the most recent rankings include best regional university in the North. Tiffin University’s low student-to-faculty ratio earns it a spot on our list for best online marketing degrees. Tiffin University is listed among our top online schools for marketing due to the school’s low student-to-faculty ratio and relatively high graduation rate. The university offers a bachelor’s in business administration and organizational management with a concentration in marketing that is designed to prepare students for careers in various business and marketing roles. All classes are delivered online in seven-week terms that start six times per year. Classes are taught by the same university professors who teach on-campus. Tiffin is a regionally ranked institution. In fact, U.S. News and World Report ranks the school as among the best regional universities in the Midwest. Tiffin lands a top spot on our list of best online marketing schools for 2016-2017. Linfield College is one of the most affordable liberal arts colleges on our list of best online schools for marketing. One of the best online marketing schools on our list is Linfield College. The school offers an online bachelor’s in marketing program that is designed to equip students with the marketing skills needed to work and communicate effectively within a highly competitive field. All courses are delivered online and taught by the same professors who teach on the McMinnville campus. Online classes include international business law, international marketing, organizational behavior and management, promotions management, sales and sales management, and topics in marketing. Linfield offers a low student-to-faculty ratio and reasonable undergraduate tuition price that makes it appeal to working adults on a budget. Also, the school is ranked as the 128th best national liberal arts college in the country. Affordable tuition and low student-to-faculty ratio puts University of Minnesota on our list of best online schools for marketing. The University of Minnesota is listed among our best online marketing schools due to its affordable in-state tuition, reasonably high graduation rate, and low student-to-faculty ratio. The online BS in marketing program is designed for working students who require flexible classes so that they may maintain a work-life balance with their education. All classes are delivered online and include business writing, integrated marketing communication, internet marketing, marketing research, marketing strategies, and personal selling. A total of 120 credits are required to graduate, with 62 credits within the major. The University of Minnesota is a top-ranked institution. In fact, U.S. News and World Report ranks the school as the 40th best regional college in the Midwest and the 3rd top public school. The online bachelor’s programs rank #63 in the country. Franklin University’s affordable tuition is one of the reasons it earns a spot on our list of best online schools for marketing. Franklin University is listed as among our top marketing schools online due to the school’s affordable tuition and low student-to-faculty ratio. The program is entirely online with project-based curriculum and assignments designed to provide students with practical experience in how marketing fits into other business disciplines. Students take courses in digital marketing, global marketing, integrated marketing, marketing behavior, marketing research, and social media marketing. All classes are taught by credentialed university professors with years of experience. Franklin is ranked by major publications like U.S. News and World Report as having one of the top online bachelor’s programs in the country. Also, for those interested in pursuing an MBA or online graduate business degree, Franklin ranks among the top 100 programs. Regis University’s online bachelor’s in marketing degree program is accredited and highly ranked. Regis University is on our list of top online marketing schools for undergraduates due to its high graduation rate and low student-to-faculty ratio. The school offers an online bachelor’s in marketing degree that emphasizes strategic managerial practices within the marketing industry. All classes are delivered online and taught by university professors. Marketing courses include digital marketing tactics and tools, ethical decision making in business, influencing buyer behavior, issues in management, marketing communication, and strategic management. Regis is ranked by major publications like U.S. News and World Report as having the 92nd best online bachelor’s programs in the country. With a low student-to-faculty ratio and high graduation rate, it’s no wonder Huntington University is a best choice school for an online marketing degree. Huntington University is our 11th choice for best online marketing schools due to its low student-to-faculty ratio and high graduation rate. The school offers an online marketing bachelor’s degree program with courses taught by professors with more than fifty years of marketing experience at world-renowned companies like Fidelity Investments and Fuji USA. Online business and marketing courses include advertising and promotion, business organization and management, marketing of agricultural production, money and banking, and principles of marketing. Huntington is ranked by major publications like U.S. News and World Report as the 13th best regional college in the Midwest and is one of our top online schools for marketing degrees. A high graduation rate earns Indiana Wesleyan University a spot on our list of best online schools for marketing. One of the best online marketing schools on our list is Indiana Wesleyan University. The institution offers a low student-to-faculty ratio, with classes taught by university professors, and a high graduation rate. The overall program combines liberal arts instruction with a biblical framework that adheres to the school’s Christian mission. All classes are delivered online and include information technology for marketers, marketing research, predictive marketing analytics, and social media and consumer behavior. The school is ranked by major publications like U.S. News and World Report. In fact, U.S. News lists the university as the 27th best regional institution in the Midwest. The online BBA from University of Massachusetts covers courses in management and marketing. The University of Massachusetts is one of our top picks for marketing schools online due to the high graduation rate and relatively low student-to-faculty ratio. Students may earn a bachelor’s in business studies that covers coursework in finance, management, and marketing. All courses are taught online by the same university professors who teach on the Amherst campus. The University of Massachusetts is ranked by major publications like Forbes magazine, The Princeton Review, and U.S. News and World Report. The school’s online bachelor’s programs, including the business studies degree, rank #63 out of more than 1,200 programs. University of Northwestern Ohio offers a bachelor’s in marketing entirely online. The University of Northwestern Ohio is one of our top online marketing schools due to its high graduate rate and low in-state tuition price. Working adults and busy students can earn a bachelor’s in marketing entirely online. In fact, all classes are delivered online and taught by the same professors who teach on campus. For those interested in a combined business and marketing degree program, the school offers a bachelor’s in business administration with marketing concentration. According to the program website, successful degree candidates are prepared for careers in manufacturing, media sales, public relations, and even social media marketing. University of Northwestern Ohio is one of the best online marketing schools for undergraduates on our list. Indiana State University is a top ranked online school for marketing. Indiana State University makes it on our list of top online marketing schools due to its low student-to-faculty ratio, affordable in-state tuition, and relatively high graduation rate. Busy students can earn a bachelor’s in marketing from one of the best marketing schools online. All courses are delivered online and include business report writing, buyer behavior, marketing management, and marketing research. There are two available concentrations for the marketing major, including marketing management or sales management. For those interested in one of the concentrations, either nine or twelve additional credits are required. The university is ranked by major publications like U.S. News and World Report as a best regional college in the Midwest. Dakota State University’s affordable tuition and low student-to-faculty ratio lands it a top spot on our list of best online schools for marketing. Dakota State University is one of our top marketing schools online due to the school’s affordable tuition and relatively low student-to-faculty ratio. Busy and working students may earn a bachelor’s in business administration (BBA) with marketing concentration by taking classes entirely online. Required courses include business statistics, international trade and finance, managerial communications, marketing research, personal selling, production and operations management, and promotional strategy. Dakota State is a regionally ranked institution by major publications like U.S. News and World Report. Also, several of the school’s online graduate business programs are ranked in the top 150, making the school a top choice for online master’s degree programs. The most affordable online school for marketing is Fort Hays State University. Fort Hays State University makes our list of online marketing schools due to the low undergraduate tuition costs and moderately high graduation rate. In fact, Fort Hays State is the most affordable school on our list to offer a bachelor’s of business administration in marketing. A total of 124 hours are required to complete the degree program, including 18 marketing core hours, 12 marketing elective hours, and 6 marketing-related elective hours. The university is ranked by major publications like U.S. News and World Report. In fact, the online bachelor’s programs, including the BBA in marketing, rank #24 out of 1,200 programs. Just one more reason why Fort Hays is on our list of best online marketing schools. Old Dominion University is one of our top online schools for marketing. Old Dominion University earns a top place on our list of online schools for marketing due to the low tuition price and high graduation rate. The school also offers a low student-to-faculty ratio, even for online classes. The Strome College of Business offers an online BBA in marketing program that is designed for busy students who require a flexible learning environment. Online courses include consumer behavior, contemporary organizations and management, marketing policy and strategy, marketing research, multi-national marketing, operations management, and principles of marketing. Old Dominion is ranked by major publications like U.S. News and World Report. In fact, the school’s online bachelor’s programs rank #49 out of over 1,200 programs surveyed by U.S. News. Earn a BBA in marketing degree – 100% online – at University of West Alabama. University of West Alabama is one of our top online marketing schools to offer a BBA in marketing degree. The program is entirely online and offers courses in advertising and promotion, consumer behavior, entrepreneurship, leadership, marketing management, marketing strategy, personal selling, and services marketing. Marketing majors are required to take 30 semester hours of coursework in core classes and electives that explore contemporary marketing practices. Major publications like Forbes magazine and U.S. News and World Report rank the university as a top regional school in the South. Also, the online bachelor’s programs at UWA rank #172 out of more than 1,200 programs. High graduation rate + affordable tuition! The University of Alabama at Birmingham is one of the best online schools for marketing. The University of Alabama at Birmingham earns a top spot on our list of best online marketing schools due to the relatively low student-to-faculty ratio, high graduation rate, and affordable tuition for undergraduates. The Collat School of Business offers a bachelor’s in marketing degree that may be completed entirely online. All classes are delivered online and taught by award-winning faculty who routinely teach on the Birmingham campus. Online marketing courses include entrepreneurship and marketing planning, integrated marketing communications, international marketing, marketing research, professional selling, and social media in marketing. The university is ranked by major publications like U.S. News and World Report as having the 86th best online bachelor’s programs in the country. Dallas Baptist University is the best online school for marketing on our list! Dallas Baptist University earns our #1 spot for the best online schools for marketing thanks to the institution’s low student-to-faculty ratio, high selectivity for admissions, and graduation rate. The school’s College of Professional Studies offers a bachelor’s of business studies in marketing that can be completed entirely online. Required courses for the marketing major include business and public law, marketing research and analysis, principles of marketing, professional selling and sales management, and strategies and problems in marketing. The private institution is nationally ranked by major publications like U.S. News and World Report. In fact, the online bachelor’s programs, including the marketing program, rank #114 out of 1,200. This concludes our ranking of the best online schools for marketing in 2016-2017.